Are you a researcher who’s planning to submit an NIH application for natural products clinical research? Have you heard about NCCIH’s new approach to funding clinical trial research? NCCIH has developed a new series of funding opportunity announcements (FOAs) specifically for investigator-initiated clinical trials. They focus on natural product studies and mind and body intervention studies. In this blog post, I will explain how our FOAs will support researchers making discoveries in natural product clinical research. It’s important to know that we are no longer accepting most clinical trial applications through the Parent R01 FOA because we have developed more specific funding opportunities that will allow researchers to incorporate a larger amount of relevant information in their grant applications (see NOT-AT-17-006). The development and testing of natural products requires multiple stages—and we’re committed to providing funding opportunities for each stage. NCCIH has determined that clinical trials of natural products can be most informative when there is reproducible evidence that the product can have a measurable impact on a biological signature of the potential mechanism of action. There are funding opportunities to support early stage human research on natural products to demonstrate that the product can produce a reproducible impact on this biological signature. When enough preliminary data exists, researchers can use a different funding mechanism to support the conduct of a multisite efficacy trial. 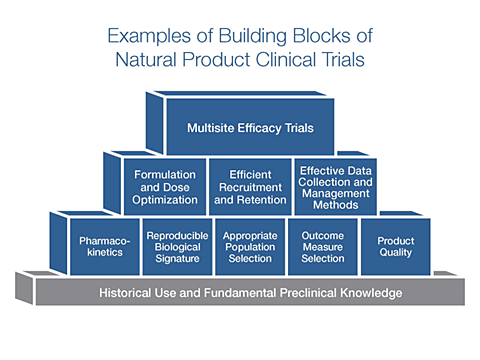 There are a number of “building blocks” or preliminary data needed to build a solid foundation for a large-scale efficacy study of a natural product (see figure below). Animal or in vivo establishment of mechanisms/biological effect (if available). Pharmacokinetics of the product in the patient population to determine what frequency of dosing is needed (and possibly assess different formulations or delivery systems—e.g., enteric coating). Pharmacodynamics—to establish that the product can produce a measurable (and ideally clinically meaningful) impact on a biological signature when given to humans. Replication of the pharmacodynamics—to replicate impact of the product on the biological signature and ideally optimize the dose to have the largest impact on the biological signature without the production of frequent or severe adverse events. Along the way, establishment of the feasibility of trial methods such as recruitment, retention, data collection, participant followup, and data management. If we have more questions who do we get in touch with? Please are non US citizens eligible for NCCIH funding? this type of applied trials in measured results of people’s feelings of well being after new types of treatments seems like a good approach to new research ideas! @Snu Becker, Please direct your inquiries to our Division of Extramural Research at NCCIHDERInquiries@mail.nih.gov. @Lawal Bilbis, We fund institutions rather than individuals. In general, investigator-initiated clinical trials that study an intervention delivered to human subjects will be limited to studies carried out within the United States and Canada, with the exception of a few special settings. You may want to contact our Division of Extramural Research to ask about your specific interests at NCCIHDERInquiries@mail.nih.gov.